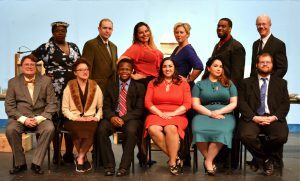 SOUTH HOLLAND, IL – Spies, murder, love, suspense and other trademarks of Alfred Hitchcock come to life at South Suburban College’s Kindig Performing Arts Center. Performances will take place on September 21 and 28, 2018, at 7:30 p.m., and September 22, 29 and 30, 2018, at 2:00 p.m. Through the magic of live sound effects and musical underscoring, Vintage Hitchcock: A Live Radio Play is a triple feature that recreates a daring train chase, a serial killer’s ominous presence, and a devastating revelation of spies and subterfuge. The stage setting is that of a typical radio station of the 1940s. The PAC Rats Radio Players perform not only the characters for The Lodger, Sabotage and The 39 Steps, but also generate the wide variety of sound effects needed to bring the stories to life. Vintage Hitchcock, written by Joe Landry, features the vocal and foley talents of Heather Young of Chicago, Sabrina Smith of Dolton, Paul Braun of Highland, IN, Bob Colton, Marilyn Kopacz and Pat Nevins, all from Homewood, Charlie Furtek of Lansing, Kevin Hathaway of Park Forest, Kimberly Azana of Posen, Malcolm Banks of Riverdale, Catherine Hundt, Chris Johnson and Ashley Orendorff, all from Thornton. The behind the scenes artists are costume designer JoAnna Tassin of Park Forest with costume assistants Joan Sehlke of Dolton, and Judy Welch of Sauk Village. The sound engineer is Jordan Swierczyna of Robbins. Angela Martin of Midlothian is the production manager. June Wagner is the stage manager and Ellie Shunko is the set designer, both of whom are from Lansing.